Today, let's begin with an unlikely pair: pug and poodle. Pugs are the burly halfbacks of the dog world, even when they're girls. In contrast, poodles are prissy little things who prance. Join the two together, and you have this honey-colored beauty. She looks less prissy and more halfback to me - perhaps she's a quarterback??? Speaking of feminine dogs, how about this little doll? 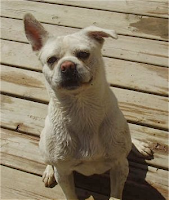 She's a chow chow/pug mix who looks like she belong in Paris Hilton's bag. 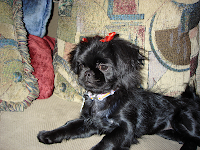 This one is definitely a girly-girl, red hair bows and all. I'd love to know if she's got a black tongue, one of the chow's distinguishing characteristics. 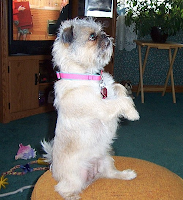 Next, a shih tzu/pug mix who just begs to be loved. Who could deny this sweet thing whatever he wants? I'd spoil this wacko pug until he was completely insufferable (kind of like my dog!). And how about this built-in lifeguard of a dog who can signal storm warnings with his contrary ears? He's an Eskimo dog/pug mix, a combo I never thought I'd see. 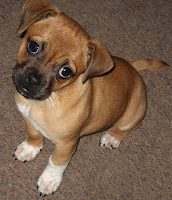 I can't imagine anyone saying "hit the road, Jack," to this adorable Jack Russell/pug pup. I bet he's nothing but trouble, but he's a real cutie. 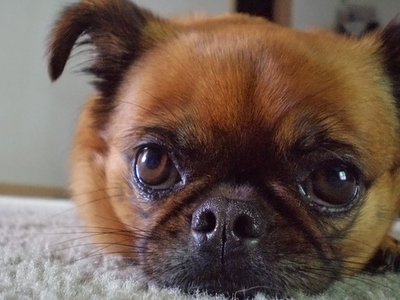 And I'll end this installment of Wacko Pugs with the wise, knowing eyes of this pomeranian/pug dog. He is undoubtedly an old soul who would cuddle up with you just to let you know that everything will be okay. Like the rest of these unique creations, what a great dog. Awww... what pretty dogs. My famiy had apug/chow mix for 10 years. His name was Sally (short for Saliva. He didn't look like the on in your post, but he did have the black tongue. He simply looked like a big golden pug (the height of a chow) with a chow's snout. And his most notable feature is his pig-like curly tail. He was the sweetest and laziest dog ever. But he was the love of our lives. Such big eyes! I love dogs with big eyes. They have that precious look which you can never resist especially when those big eyes are teary. Mixing a pug with other breed will always be a success. It's strong face features look really cute when cross bred. Denis Leary is just stupid. Or lazy. Or both.